Even though the tail end of his career was blighted by injury, Christian Cullen is regarded by many as the finest fullback the game has ever produced. A prodigious talent, he announced his arrival on the world scene at just 20 years of age, scoring a hat-trick on his All Blacks debut in a game against Samoa. In his next outing for the Kiwis, against Scotland, he went one better, notching four tries against Scotland. The tries continued to flow thereafter and after playing an integral role in New Zealand's triumph in the inaugural Rugby Sevens event at the 1998 Commonwealth Games in Malaysia, Cullen was a part of the All Blacks squad which travelled to the 1999 World Cup. However, Cullen did not enjoy the tournament as he was played out of position in midfield. 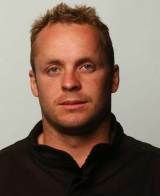 Restored to fullback the following season, Cullen again excelled and he went on to break New Zealand's all-time try-scoring record, scoring 46 times for his country in 58 Tests (his tally has since been surpassed by Doug Howlett) before leaving to link up with Munster in 2003. His time in Ireland was ruined by a succession of injuries, though, and he retired from the game in the summer of 2007. However, he had by then already done enough to ensure himself legendary status the world over.